Something seems wrong at first reading, an "exclusion" still exists, so after all the Primal Vow is not quite universal, there are some people that aren't embraced by the Compassion of Amida. But is this the way things really are? In my first days as a Jodo Shinshu follower, when I still did not have a direct contact with anyone from our tradition, I was trying really hard to understand the purpose of this "exclusion". I admit that I got really frightened every time I read that part. It was like a lump in the throat, like I never managed to really enjoy my meeting with Amida. "What if I committed one of those grave offenses? ", I kept asking myself over and over again. I had met with Amida’s Primal Vow in a very difficult time, when I felt like I couldn't handle my own life, and now, after the joy of a hope, I kept hitting against this phrase that was refusing to go away. However, it wasn't long until the calm got in my heart for good - "everything is all right, how could you doubt me?" seems that Amida would have said. We all have been admonished at least once by our mothers while we were kids and our behavior got unbearable. Maybe we were afraid in that moment that she will leave us or who knows what she will do if we do not behave properly, but in the end she was always there, no matter how we acted, admonishing us, trying her best to change us, but always welcoming us with her love. In the same way, Amida Buddha's Compassion is like a mother's love, and the "exclusion" in the Primal Vow is just an admonishment addressed to some stupid and crazy kids, that are always ready to make mistakes. It's not an "exclusion" in its own way, but a warning: "some actions are very serious, do not commit them, or else ...". But that "or else.." remains unfulfilled because of the first part of the Vow that proves the unconditioned salvation of a real mother. „By showing the gravity of these two kinds of wrongdoing, these words (the exclusion words) make us realize that all the sentient beings throughout the ten quarters, without a single exception, will be born in the Pure Land." I think that the mentioning of these gravest offenses is a clue that they are not wanted in the behavior of the disciples but in the same time the effects of those offenses are annihilated by the Compassionate Power of Amida Buddha when we genuinely entrust ourselves to Him. This is a hint at the Primal Vow, where to say Nembutsu even ten times is mentioned as the assurance of birth in the Pure Land! Thus, we should look to the above passage as a proof that those who did the five grave offenses are not really excluded from Amida’s salvation. „From the evidence of this sutra, we clearly see that ordinary people of the lowest grade are all enabled to be born in the Pure Land through faith in the Buddha, if they do not abuse the right Dharma”. How are these two sutra passages to be reconciled? „Question 2): Suppose a person has committed the five grave offenses but has not slandered the right Dharma. In the sutra, it is granted that such a person can attain Birth. Further, suppose there is a person who has only slandered the right Dharma but is free of the five grave offenses and other evil acts; if he aspires for Birth, will he attain it or not? „This is because slandering the right Dharma is an evil act of extreme gravity. Further, the right Dharma is the Buddha-Dharma. Such a foolish person has already slandered it; how can it be reasonable to think that he would aspire to be born in the Buddha-land? Suppose the person aspires for Birth merely because he craves to be born into happiness; this is like seeking ice that is not water or fire without smoke. How can it be deemed reasonable that he attain it? Question 3): What are the characteristics of slandering the right Dharma? The Buddha thus did not mention the time of their release from the Avici hell. This is because the transgression of slandering the right Dharma is extremely grave. The Larger Sutra is the Amida Dharma or the right Dharma taught by Shakyamuni Buddha with the intention of helping sentient beings to be born in the Pure Land of Amida. Those who do not take this sutra and Dharma as being genuine, but call it a fictional or mythological story, how can they be reborn in a Pure Land of a Buddha whose existence they actually deny? Indeed, as T’an-luan said, “it does not stand to reason”, isn't it ? "Have slandered it" refers to a slander that still goes on in that person’s mind, but it does NOT refers to a situation in which he slandered it in the past and now, through a change of heart, he understands the evil he did and repents about it. It’s logic to say that a person who still slanders the Dharma, denying the actual existence of Amida Buddha and His Pure Land, and spreading such perverted views to others, cannot have a true faith and sincere aspiration for birth in the Pure Land, so he is self-excluding from Amida’s Primal Vow. Attention here! Not Amida is excluding such a person, but he excludes himself from the salvation oferred by Amida. As I previously said, Amida Buddha wishes to save us all, but He doesn’t take us to His Pure Land by force, so if we do not wish to go there or we do not accept the existence of that enlightened realm or the existence of Amida, then we’ll not go there. Nobody can go to a place which he thinks it doesn’t exist and can’t be saved by someone whom he considers being an imaginary person. This is logical, isn’t it? However, the exclusion or self-exclusion sentence in the Primal Vow has no effect if slandering the Dharma becomes a mistake of the past, a mistake which is now repented. So, the one who slandered the Dharma in the past, but goes through a change of heart in the present time, admits his mistake, feels sorry for his act and relies with sincerity on Amida Buddha's Compassion, will attain birth in the Pure Land. Its logic to be this way. 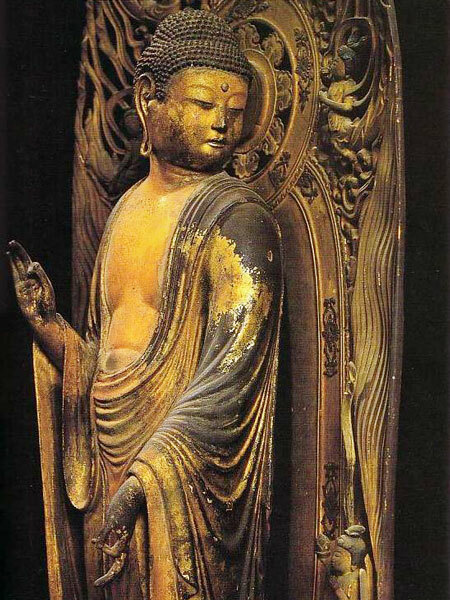 As Shinran said, „'excluded' reveals how grave the evil of slandering the Dharma is”, but doesn’t mean that one who has repented and now accepts the existence of Amida Buddha and entrusts oneself to Him, is not saved! In Buddhism there are no eternal „punishments” except for a mind locked in mistake, which in fact punishes itself, but the mind that changes its ways can not be the same as the old one. This reminds me of a thing that happened during Shakyamuni's time. A man offended the Buddha really bad, throwing in His face with every kind of harsh words, but the next day he felt sorry and asked for forgiveness. Going before Him, he kneeled and asked forgiveness. Buddha said: "Get up, the person who stays now in front of me is not the same as the one offending me yesterday." The nembutsu follower who has genuine faith in Amida Buddha cannot slander the Buddha Dharma and so, if he did that before receiving faith, the karmic effects of such a slander have been purified, as he is now a new man, a born again person in the light of Amida Buddha's Compassion, completely separated from the old man of this life or the past lives. According to Tzu-chou, there are two traditions concerning the five grave offenses. 1) Destroying stupas, burning sutra repositories, or plundering the belongings of the Three Treasures. 2) Speaking evil of the teaching of the three vehicles, saying they are not the sacred teachings, obstructing and censuring it, or attempting to hide and obscure it. 3) Beating those who have abandoned homelife, whether they observe precepts, have not received precepts, or break precepts; persecuting them, enumerating their faults, confining them, forcing them to return to lay life, putting them to menial labor, exacting taxes from them, or depriving them of life. 4) Killing one's father, harming one's mother, causing blood to flow from the body of the Buddha, disrupting the harmony of the sangha, or killing an arhat. 5) Speaking evil by saying there is no cause and effect and constantly performing the ten transgressions throughout the long night of ignorance. 1) Killing a Pratyekabuddha out of evil intentions; this is destroying life. 2) Violating a nun who has attained arhatship; this is an act of lust. 3) Stealing or destroying what has been offered to the Three Treasures; this is taking what has not been given one. „Eighty koṭis of kalpas” is used here to mean, all evil karma he did from the infinite past till present. Many nowadays false teachers who are slandering the right Dharma, often use the formless Dharmakaya (Dharmakaya of Dharma-nature) which is the Buddha nature of all beings and of Buddhas themselves, as an excuse and argument to reduce all transcendent manifestations to mere symbols or metaphors, or even go so far as to blame “folk Buddhism” for their presence in the canonical writings. But surely, Master T’an-luan did not share such distorted views when he clearly said that exactly because Dharmakaya is formless, there is no form which it cannot manifest. “Unconditioned Dharmakaya is the body of Dharma-nature. Because Dharma-nature is Nirvanic, Dharmakaya is formless. Because it is formless, there is no form which it cannot manifest. Therefore, the body adorned with the marks of excellence is itself Dharmakaya”. In the case of Amida Buddha, this is the Form He has taken in the Pure Land; it is Amida as described in the Larger Sutra by Shakyamuni, and as seen and heard by the audience gathered together on the Vulture Peak to listen to this sutra. It is Amida who always accompany us, sentient beings who entrust to Him. Ultimate Dharmakaya or Dharmakaya of Dharma-nature is beyond time and form, so it cannot be perceived as an object of faith. In this ultimate Dharmakaya we dwell only after we attain Buddhahood in the Pure Land, but here and now ordinary unenlightened people like us cannot relate to it, nor understand it. This is why Amida Buddha does not remain secluded in His ultimate - formless Dharmakaya, but has manifested himself in the form described by Shakyamuni in the Larger Sutra, and has established His Pure Land. “What is the cause of not practicing in accord with the Dharma, or in agreement with the significance of the Name? To negate the existence of transcendent Buddhas, including Amida, with their various manifestations, is, according to T’an-luan, the most evil act of abusing the right Dharma. This is why he defines the slandering of the right Dharma as to say „there is no Buddha”. You can read more about the modern heresies and how I counteract them in my book, The True Teaching on Amida Buddha and His Pure Land, Dharma Lion Publications, Craiova, 2015. Also, please reffer to the chapter „The doctrine of the Three Buddha-Bodies and the Two Buddha-Bodies in relation with Amida Buddha and His Pure Land” from page 88 in this book.